A spicy green condiment made with cilantro, jalapeno, and garlic. This is so good! 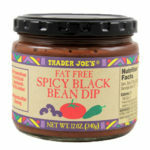 I always like trying new Trader Joe’s dips/sauces, but some are better than others. 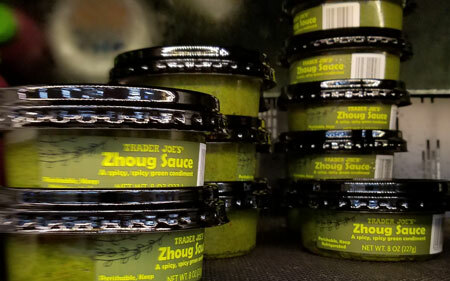 I’d never had (or even heard of) Zhoug sauce before, but it sounded interesting — and after trying it, I’m really glad I bought it. I’ve tried it as everything from a dip for chips to middle eastern wraps to tamales, and it’s been great in every scenario — super versatile and goes well with all kinds of dishes and snacks. I hope TJ’s keeps this in stock long term, because it’s going to be a regular purchase for me! 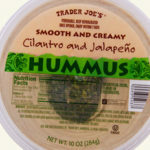 One other note: it’s MUCH better than TJ’s cilantro/jalapeno hummus (not that it’s hummus-like, but I say that because if you’re looking for something with those flavors, this is a much better bet). This stuff is amazing!! I picked it up as soon as I saw it! I’ve been missing the green tahini sauce that TJ’s had for a while but discontinued due to quick spoilage- I used to eat that tahini sauce with literally everything. (Sad face) HOWEVER! This sauce is really so good! And I’m so pleased it has a very simple and short ingredient list- ive used it so far for a dip for veggies and a sauce for grilled meat! I just made a really yummy instapot (slow cooker setting) meal tonight. 3 BS chicken breasts and a container of the zhoug sauce. And that’s all! I added cauli rice and some more chopped cilantro and a dollop of sour cream, at the end and boy…. It was sooo good!!! 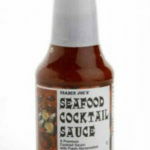 I hope Trader Joe’s keep this one on the shelves for a long time!! My best friend and I call this Magic Sauce because you can put it on literally anything and it tastes good. Okay, so we haven’t tried it on chocolate ice cream or anything, but I’m not promising we won’t try that combination either! I hope they keep this permanently. I live in a rural area and only make it to TJs once a week, so stretching out one container of this is torture. I could easily eat a container every day to myself. This stuff is such a hidden gem! A friend pointed it out to me and I’ve been putting it on everything from stir fry to pizza to tacos! It’s amazing on everything. Please never stop making this stuff! I tried this stuff and my husband and I both thot it was WAY TOO HOT!!! The description “Spicy Spicy” just doesn’t cover it. We are not sissies and eat peppers etc. I know that jalapeno peppers can vary widely in “hotness” but this is just sick. Maybe mine was made with Scotch Bonnets or Ghost Peppers? Too bad too because everything else about it is delicious. I will return it next time I go to TJ and keep my eye out to see how long it lasts. Try it! This stuff is great. I can only find it at certain trader joes. The one closest to me does not carry it. I used it in several different dishes and it made all of them better. Just tried this last week and will officially be stock piling this sauce!! I substituted it for pesto in a recipe and it was ridiculous. If you enjoy some spice, this is the ticket. Delicious on grilled shrimp and I would imagine just about anything else. Amazing and sooooo glad to see the positive reviews of this sauce since I’ve become so hesitant to try anything new at Trader Joe’s because the minute I do- and like that item, it’s almost a guarantee that they will discontinue it (like the green tahini, the sticky rice and mango, the carrot ginger soup, the asparagus soup, etc) I could go on but I’ll spare you! Suffice it to say- this sauce is everything!!! Put it on anything you want to ramp up! PleaseTJ’s………do us all a favor and let this one be one you keep available. I love, love this sauce! I, like others, will be stockpiling this. For those who find it too hot, add mayonnaise or sour cream and dilute it down as much as you want. 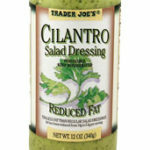 The flavor is outstanding; great on any kind of sandwiches or as a sauce for chicken. Another great find at TJ’s. I accidentally found this sauce while trying to avoiding the long check out line! 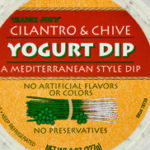 I don’t like tj’s hummus as others do, and not a fan of any dipping or whatsoever. However, this sauce is so awesome!!! I mixed it with my stir fry mushroom with chicken, turns out so well!! Wish they have a bigger size available! This is stone cold delicious. I bought this and their vegan pesto and was beyond pleased at the tastiness! KEEP THESE PLEASE! Delicious product, it’s now always on my list, I wish they would replace the canola oil with olive oil. If you like spicy, you’ll love this stuff. We’re hooked – it’s a great shortcut to liven up your rice, veggies, soup – the possibilities are endless. Please keep it coming, TJ’s! 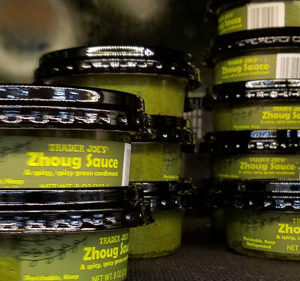 TJ Zhoug sauce is an excellent product. I have been searching for a fresh cilantro chutney-type sauce for years, and now I can stop looking. This one is excellent and pairs perfectly with your Vegetable Masala Burger and also your Vegetable Samosas. The heat level is just right. I also appreciate the “clean” ingredients. Please do not change this receipe, and do continue to offer this product at your North Wales, PA location.